Clocks have been dutifully moved forward and we’re all a bit sleep-deprived. The great outdoors reveals daily–sometimes hourly–changes as spring happens. Vibrant green, accompanied by pops of color, appear at every turn as I enjoy a post-sunrise stroll through the garden. Demanding my eyes turn toward the ground is this blast of sunshine in flower form, Golden groundsel, Packera obovata, . Adjacent to the groundsel, one of my two Mountain laurel trees, Sophora secundiflora, calms the groundsel’s screaming yellow with dripping blue-purple clusters. 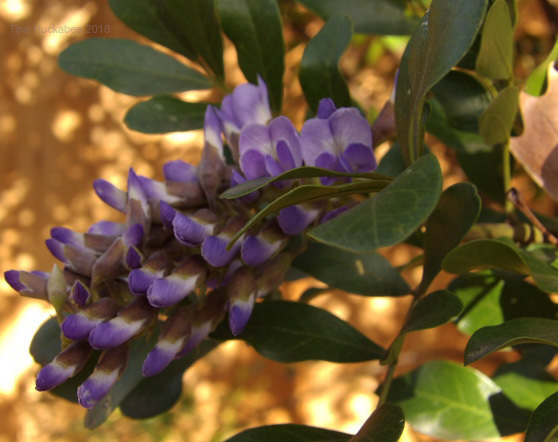 The other Mountain laurel boasts blooms whose faces reach toward the emerging blue sky, enjoying the warming sun. Not outdone by either yellow or purple, a Crossvine, Bignonia capreolata, showcases belled blossoms for pollinators, though in early morning, no visitors have arrived. Giant spiderwort, Tradescantia gigantea, currently dominates the floral palette of the back garden. A passalong plant from years ago, it is a triumphant spreader of royal purple. This Spiderwort group decorates the front garden; no doubt, it will also seed out, given the work of the bees. 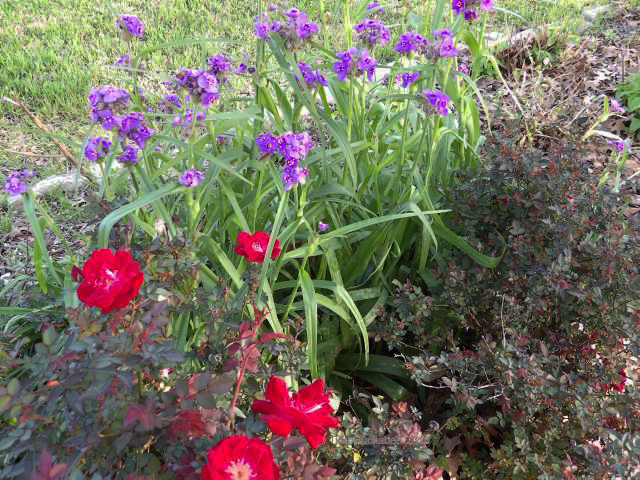 The Spiderwort cluster pairs with two second-year Martha Gonzales roses. 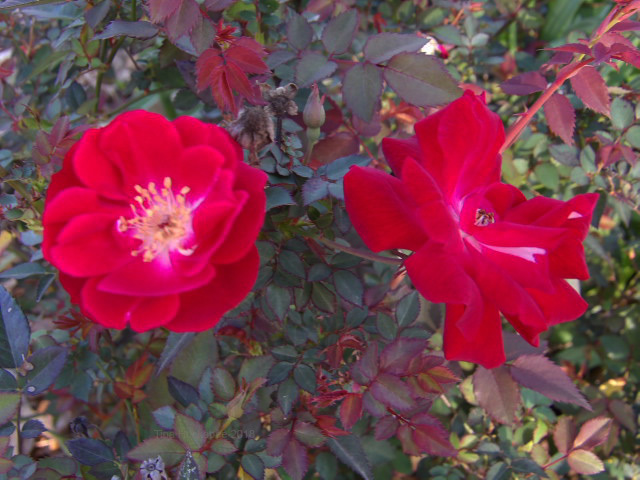 Burgundy in foliage and scarlet in petals, this tough rose is a must-have for my garden. 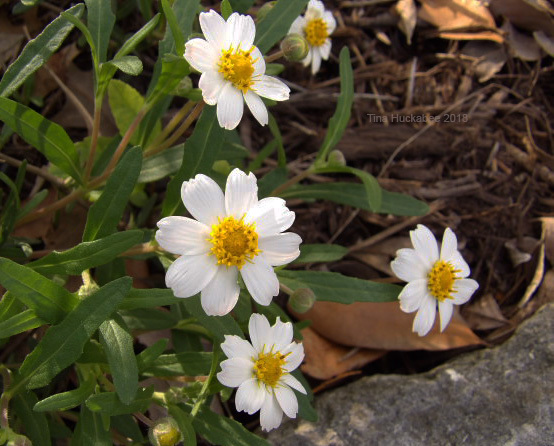 Planted last autumn after Hurricane Harvey laid waste half of an Arizona Ash tree, the happy-faced, tough-as-nails Blackfoot daisy, Melampodium leucanthum, is open for blooming business and will relish the full sun now available. 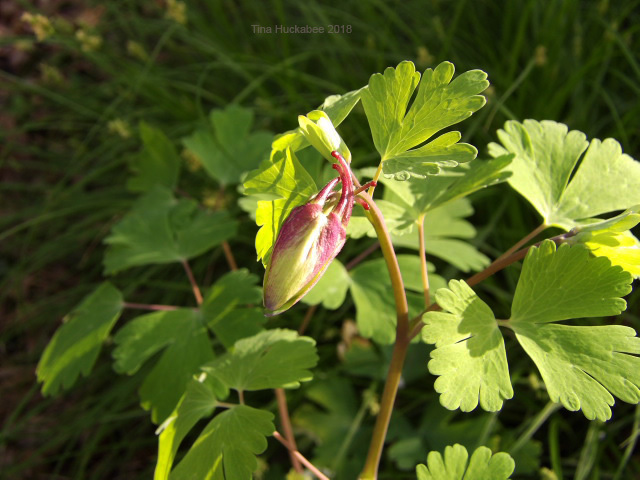 An as-yet unfurled Wild red columbine, Aquilegia canadensis, awaits its flowering turn in the morning sun. Daily changes of seasonal beauty allow pollinators and gardeners satisfaction with their efforts. What’s in your spring garden? 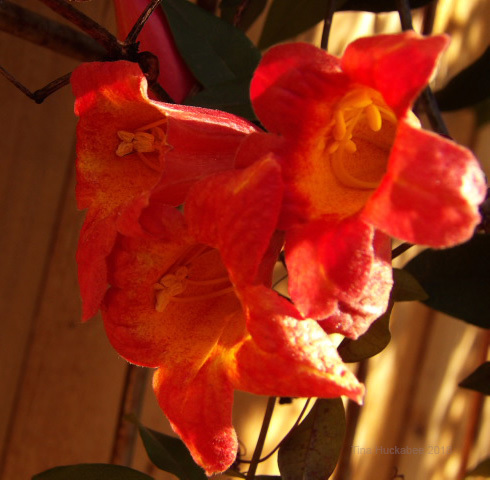 This entry was posted in Uncategorized and tagged Spring Garden, Texas Native Plants by Tina. Bookmark the permalink. Tina her photos are magnificent and all her flowers are beautiful. 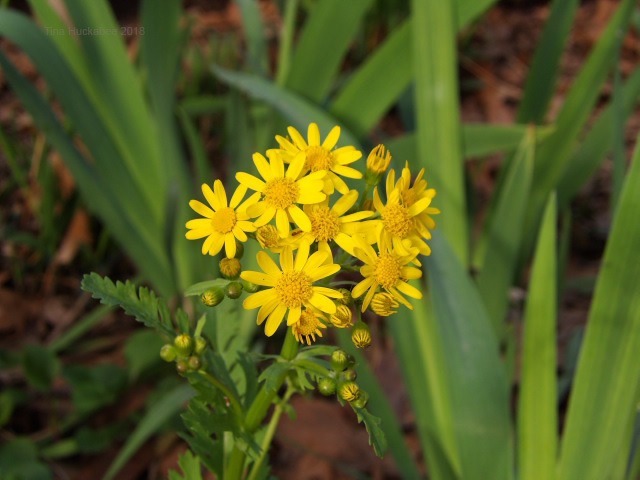 The golden groundsel with its yellow color looks like a lovely daisy. 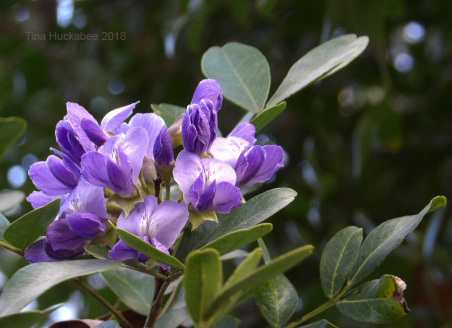 The mountain laurel tree with purple blue clusters of beautiful flowers is wonderful. 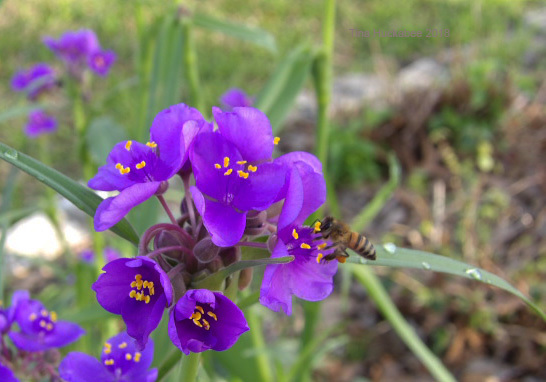 Spiderwort with its royal purple color is really beautiful; and more with the bees working. The Martha Gonzales Rosal with its begoña foliage and its beautiful scarlet flowers is gorgeous. Melampodium leucanthum is cute. The Aquilegia canadensis is beautiful still closed. Tina I really like that you can enjoy such a beautiful garden. Here in Spain we continue with cold, rain and a lot of wind. I am in Madrid, but I keep an eye on the weather predictions for my country house, which I hope to go to at the beginning of April, if there is no snow; because another wave of cold comes over us in a couple of days. Tina that enjoy its good temperature and thank you very much for showing us your beautiful flowers. Have a happy week. Greetings from Margarita. Thank you, Margarita. Spring is such a lovely time of year and easy to enjoy the many, many blooms. I hope your weather improves and that you too will enjoy a beautiful spring. The mountain laurel and crossvine are rad. I discovered the mountain laurel by accident while researching a species of Kalmia, the mountain laurel of Pennsylvania. I liked it enough to purchase seed (which I never do). There were very easy to grow. I met the crossvine growing wild in Oklahoma. Although I did not get any of it, I later acquired a related species. I intend to get the native of Oklahoma eventually. Yes, those two plants are rad. 🙂 I think there are many cultivars of both of these plants. Cultivars are nice, but for these plants, I would prefer the straight specie, as they are found in the wild. I don’t know much about them though. No matter how good we think our gardens are doing here in the UK, you just can’t beat Texas! We haven’t done our clocks yet. Is it early this year? Well, that’s high praise, indeed! It’s hard to beat the beauty of the English gardens. I think we’re just a little bit ahead of the bloom-curve in our weather patterns. Thanks, Val! That purple really does pop, doesn’t it? I need to get a shot of the multitudes of them in my back garden–before some of them get pulled! Sigh…I’m craving this kind of color now, as we are still thawing in the north. I have some Snowdrops blooming, but that is it. Still, your beautiful blooms are so cheery and convincing that spring is just around the corner. Thank you! Hang on–spring is coming your way, and soon! Just remember how glorious April through October (and beyond?) are! The blooms are looking good at your part of the state. There is not much happening here, as the freeze really knocked the perennials back. They are just starting to come out of the ground. Many of my more summery perennials are just making an appearance from the ground. But once it starts, there’s no stopping it! I don’t have a spring garden as down here we are just going into autumn. I just discovered your blog and enjoyed seeing your beautiful bright colours. I’m glad you enjoyed the spring color show, but I’m sure you have some beautiful autumn blooms and color! Well, we do, salvias and sedum and so on: plants that can take hot dry weather. We don’t have any autumn colour on our trees yet, the temps haven’t got low enough yet. In fact, although it’s autumn, we have three days of 35 degrees forecast . The sunny sophora is so beautiful! I think it’s the color combo: blue-purple flowers against darkish green leaves. Yes it is! Actually, my two Mt. laurels grow in a fair amount of shade (they are understory trees in the wild), but those in full sun? Wowzer! My neighbor across the street has on in full sun and it’s bursting with purple beauty–and fragrance, too. Mt. laurels are well-known for their grape-soda fragrance. I nearly fell off my chair when I saw your mountain laurel blooms. I swore I wasn’t going to miss photographing those flowers this year, but the bush I want to go back to is in the hill country. I stopped reading and called my friend whose mountain laurel it is, and she said — not even a bud, yet! She says all she has blooming are some iris. I suppose it’s the altitude, for one thing — and perhaps their relative lack of rain. We’ll see. She says the laurels are blooming like crazy in San Antonio. I’d better hit the road soon, I think. She has an entire wall covered with crossvine, too, and not a bloom, yet. Just as a side note, it’s clear that what I found isn’t your groundsel. The leaves are obviously different. Yea, me, for finally remember to get some photos of stems and leaves! Better crank up that car! ( I know it has a name, though I can’t remember it.) Here in Austin, the Mt. laurels are gorgeous–so hurry! They’re lovely trees, year-round, but for this month (or so) of blooming, they’re something special. This is just a test, Tina. None of my comments seem to be showing up this morning. I’m going to see if it works using this notification page. I love that Sophora – I bet it’s beautiful covered in those purple blooms! I also think I have some of that same Tradescantia – or at least one with similar purple color. Mine is only a few inches above the soil yet, though. No blooms for a while yet. Oh, and I covet your Bignonia – what a great plant!!! Another great plant! I have three of them at the opposite end of my garden that have yet to bloom, so more yellow/orange to come! I love the Sophora too! Mine don’t bloom with the rigor of those in full sun, but I do get blooms enough to enjoy–it’s a stunning tree, year-round. I love the Tradescantia, though I need to yank some from the ground–they’re a bit spready. Me too! Mine don’t bloom with the rigor of those in full sun, but I do get blooms enough to enjoy–it’s a stunning tree, year-round. I love the Tradescantia, though I need to yank some from the ground–they’re a bit spready. I’ve seen some incredible blooming on Mt laurels the past couple days in the south Austin area. On my mountain laurel there is only one, pretty small cluster. Last year was much better. Your pictures are gorgeous. Thanks, Sherry! I’ve also seen some gorgeous specimens of this lovely tree. Mine have never bloomed like many do, but I still love both and enjoy them year-round.